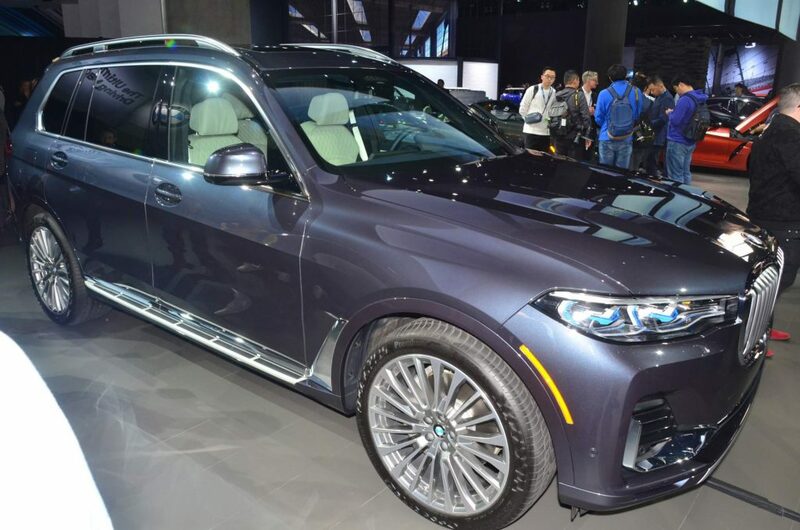 One thing about today’s auto shows is the public is already familiar with most of the debuts. 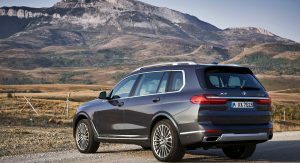 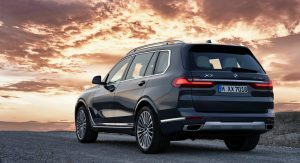 The all-new BMW X7 makes no exception. 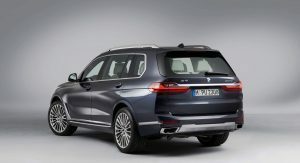 Although Munich’s (or should we say Spartanburg’s?) 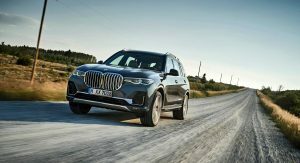 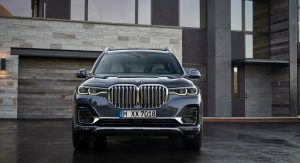 biggest SUV to date has its official world debut in Los Angeles, we’ve already seen it more than a month ago when BMW unveiled it online. 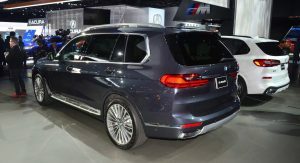 Seeing it in the metal at the LA Auto Show serves to remind us just how big this thing really is. 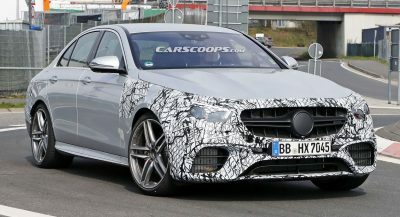 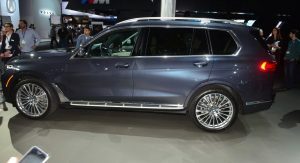 Well, it needs to be if it is to compete with Mercedes’ soon-to-be-redesigned GLS. 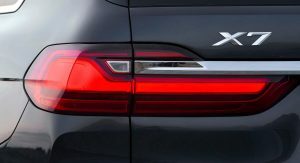 The X7 is 203.3 inches (5,164 mm) long, 78.7 inches (1,999 mm) wide (excluding the side mirrors! 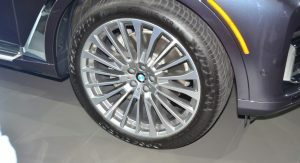 ), and 71.1 inches (1,806 mm) high. 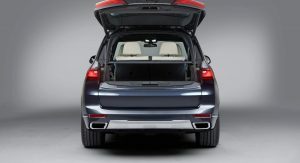 It also has a generous wheelbase of 122.2 inches (3,104 mm). 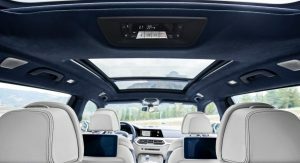 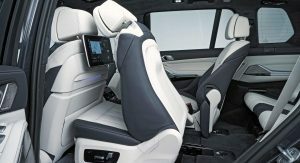 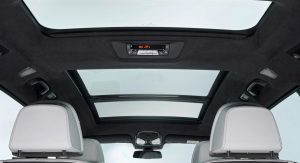 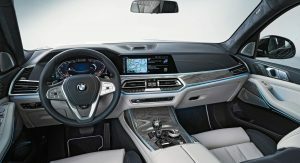 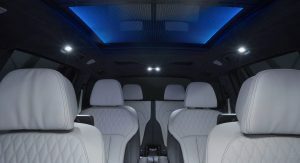 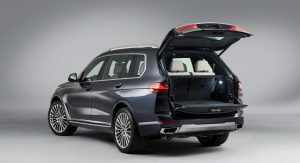 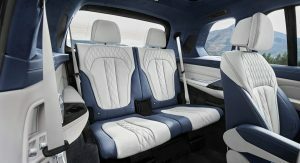 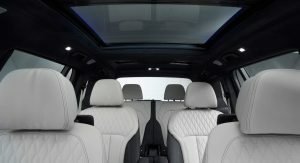 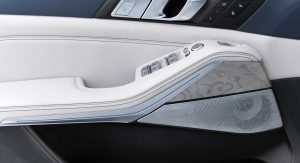 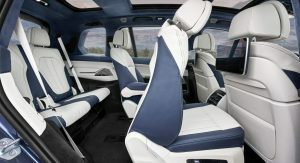 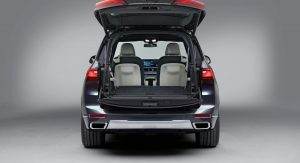 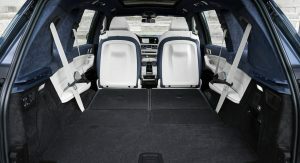 The X7 accommodates up to seven passengers on three rows of seats in a luxurious ambiance typical of BMW X models. Even with all seats in place, the boot is big enough for 326 liters (11.5 cu-ft). 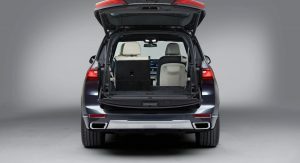 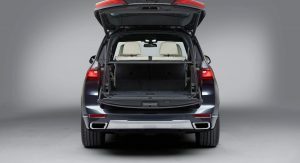 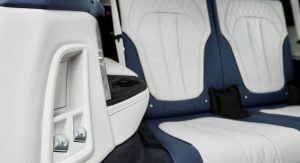 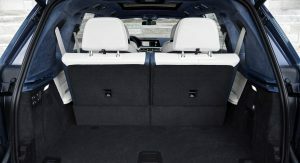 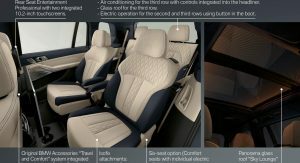 It expands to 2,120 liters (74.9 cu-ft) when folding down the second and third row of seats. 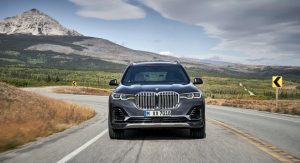 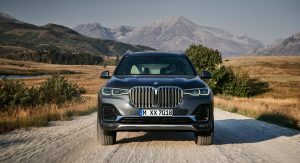 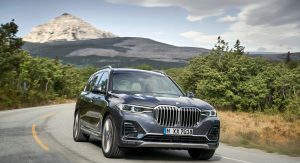 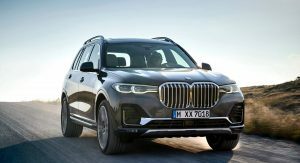 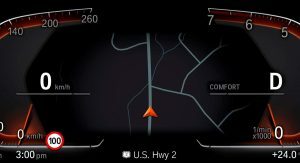 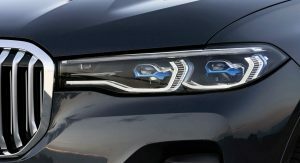 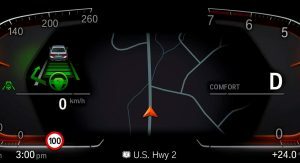 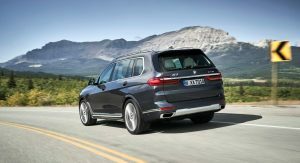 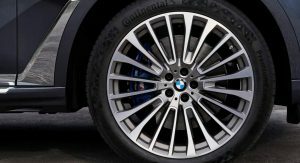 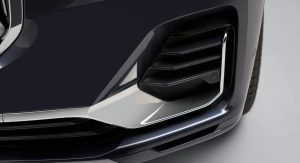 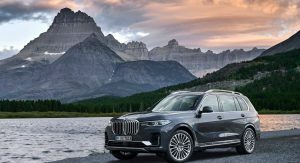 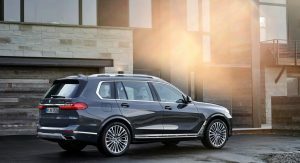 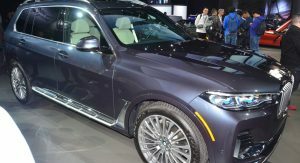 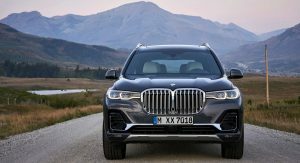 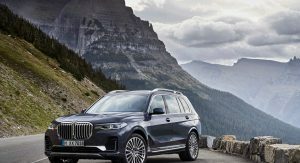 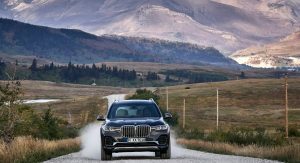 In the United States, the 2019 BMW X7 will offer two powertrains. 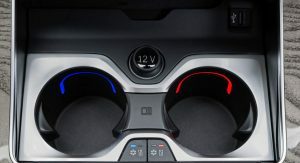 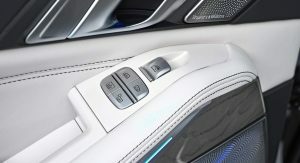 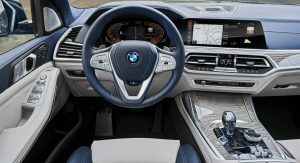 The “entry-level” xDrive40i features a 3.0-liter turbocharged inline six-cylinder that produces 335 hp between 5,500 and 6,500 rpm and 330 lb-ft (447 Nm) of torque from 1,500–5,200 rpm. 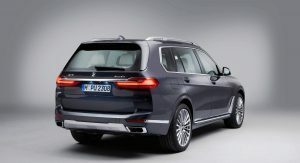 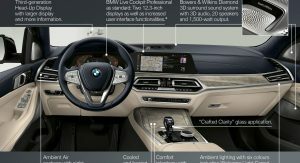 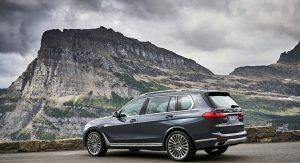 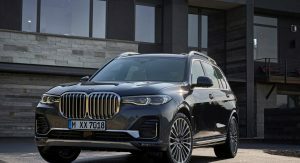 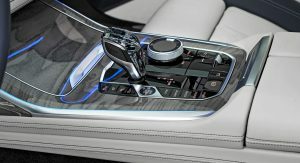 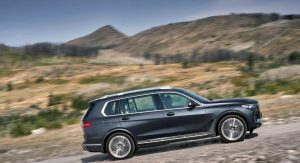 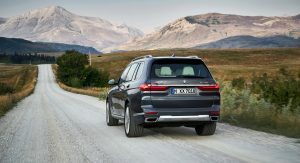 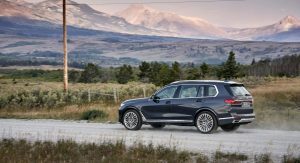 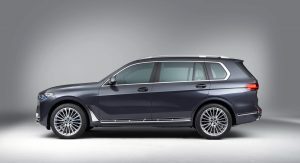 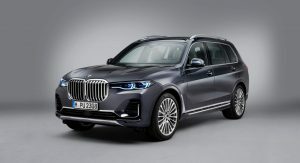 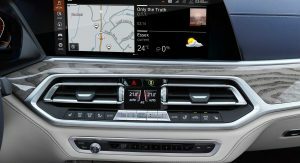 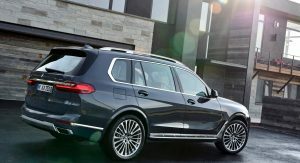 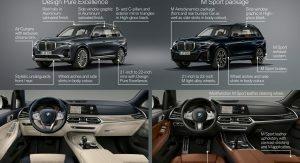 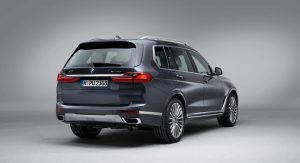 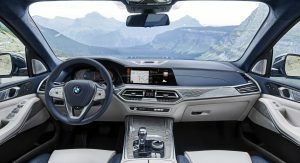 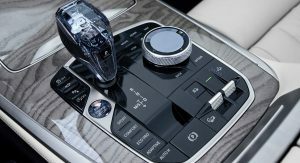 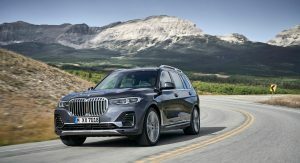 Paired to an eight-speed automatic transmission that drives all four wheels, the engine allows the BMW X7 to sprint from 0 to 60 mph (0-96 km/h) in 5.8 seconds. 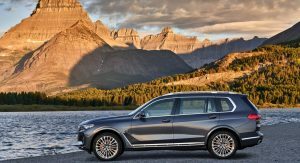 The range-topping engine is the xDrive50i which is BMW’s designation for a 4.4-liter twin-turbocharged V8 unit. 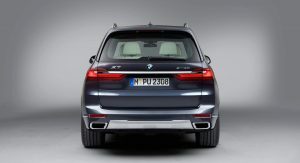 It produces 456 hp is between 5,250 and 6,000 rpm and 479 lb-ft (649 Nm) of torque from 1,500 to 4,750 rpm. 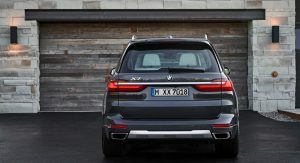 Equipped with the same transmission, the V8-powered X7 is six-tenths of a second quicker than the six-cylinder model, covering the 0-60 mph sprint in 5.2 seconds. 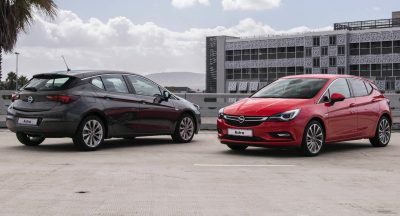 Both models have a top speed of 130 mph (209 km/h). 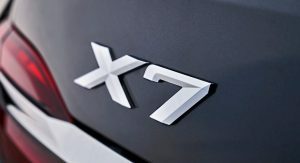 As with most BMW SUVs, the 2019 X7 will be built in Spartanburg, South Carolina, starting next week. 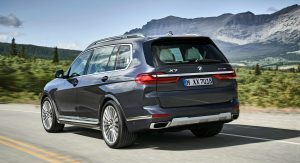 It will arrive in U.S. dealerships in March 2019 with starting prices of $73,900 (xDrive40i) and $92,600 (xDrive50i) — excluding $995 destination. 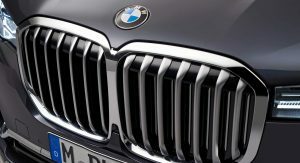 Grille needs to be bigger like it’s brethren iNext! 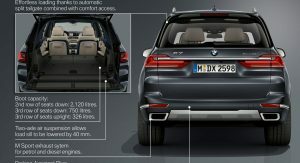 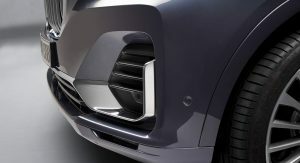 Only 70% there, c’mon BMW, I know you wanted to do it here for this big SUV. 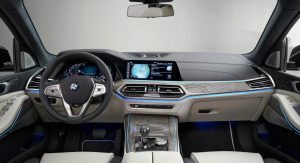 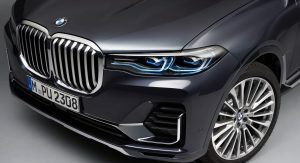 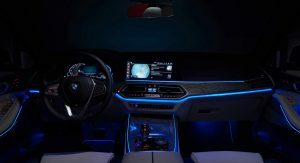 Joking aside, this BMW although looks 10 times better than the iNext concept(which is not much to brag about), it looks rather boring and uninspiring. 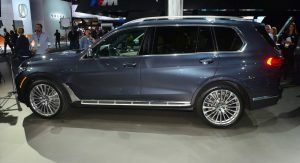 So it’s a bit smaller than the Tahoe GM family. 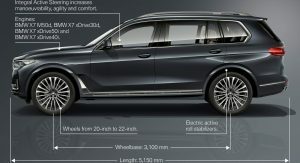 That’s not really that big. 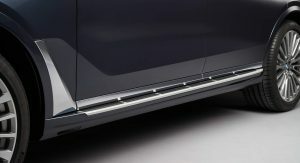 Now if it were 20 inches longer then I’d agree with the title. 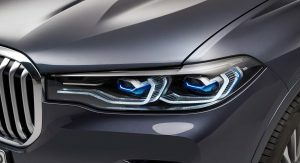 Which is why I said it’s a bit smaller. 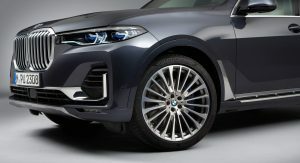 What’s your point? 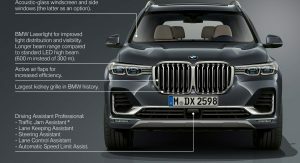 Checking out the pictures of this behemoth as one in particular caught my eyes. 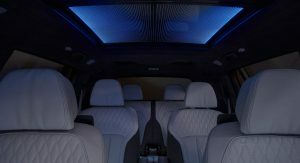 Picture 7! 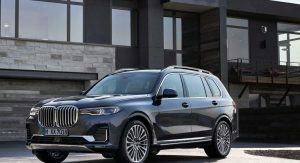 I wondered why a damn Kia was next to a BMW? 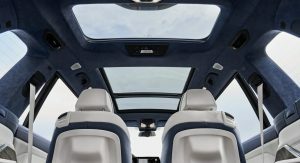 It isn’t a Kia! 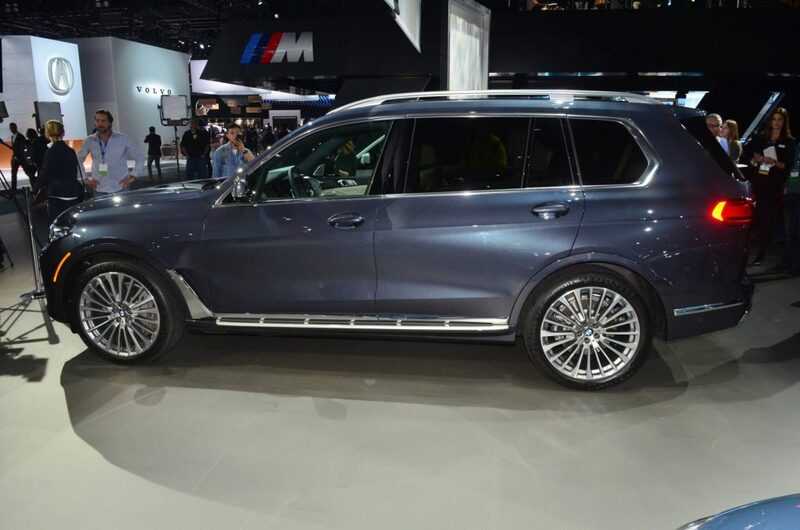 It’s an X5! 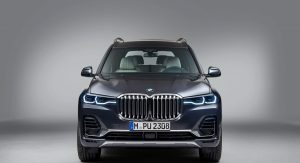 UGH, BMW has finally lost it. 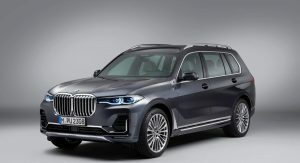 I need to see this parked next to an Escalade or Range Rover or LX because it just doesn’t look as big as BMW claims it to be (not saying it’s not – it just doesn’t look it from photos). 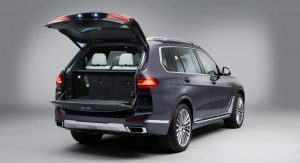 My point was that is was smaller than the Suburban family. 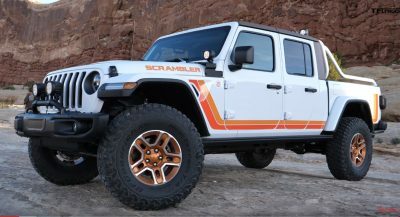 Since those are bigger the title would’ve worked better if it were their size. 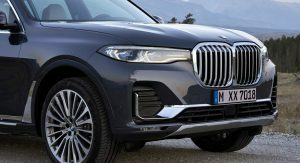 I think the top10 best looking SUV’s in the world go this, the X7, followed by the Aviator, the Rolls Royce Cullinan, the new Audi Q3, the new Porsche Macan, the Navigator, the Lamborghini Urus, the new BMW X5, the new Mercedes GLE, and the Volvo XC90. 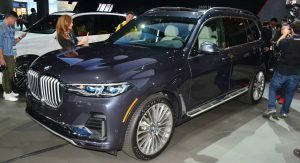 Honorable mentions to the Range Rover Velar, the regular Range Rover, XC60, Porsche Cayenne, GMC Yukon Denali, Ford Expedition Platinum, the Audi Q8, and Jaguar F-pace.